Miesha Tate cards and autographed memorabilia continue to gain popularity on the secondary market. Her ongoing rivalry with Ronda Rousey is a major contributing factor. Once seen as the potential face of the UFC's women's division, her losses to Rousey may have hurt those chances but has certainly not impacted her collectibility. In fact, it may have actually enhanced her appeal. Rousey's victories by her patented arm-bar submission showed the world just how tough of a competitor Tate is and gained her new respect and fans despite these defeats. Miesha Tate's first trading cards were released in 2011 Topps UFC Moment of Truth. She has a total of 12 cards in the product including a base card, three autographs, four printing plates and a handful of related parallels. Since the debut of her first MMA trading cards, Miesha Tate has been on the checklist of several additional Topps UFC products. 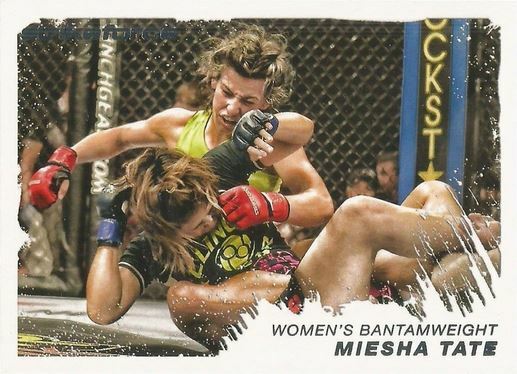 Miesha Tate's first memorabilia cards were released in 2012 Topps UFC products. Some of these cards include jumbo swatches of fight worn gear. 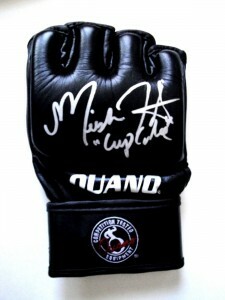 Others include octagon mat relics and combinations of autographs and memorabilia. 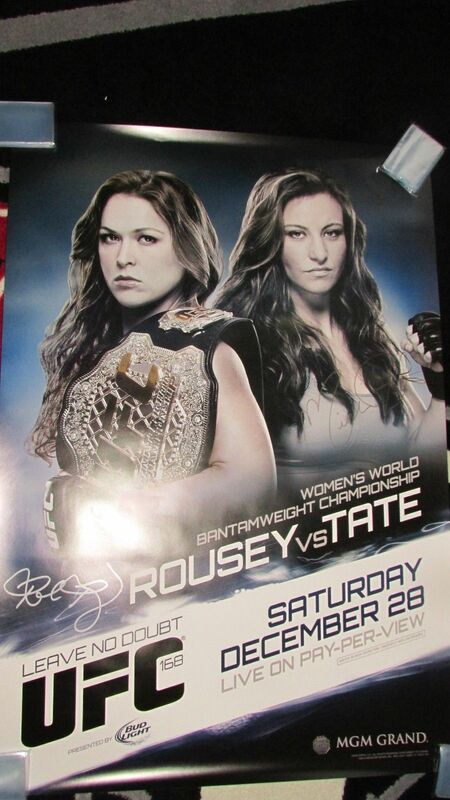 Miesha Tate autographs can be routinely found on the secondary market. Some of the most popular items are dual-signed UFC fight posters advertising her matches with Ronda Rousey. Her most popular single-signed items include fight gloves and photos. This is Miesha Tate's de facto rookie card. It features a close-up, in-action photo as she pummels an opponent. Parallels of the card include: Gold, Black (#/88), Red (#/8) and Diamond (1/1). Four printing plates of the base card are included in the product and are all one-of-ones. 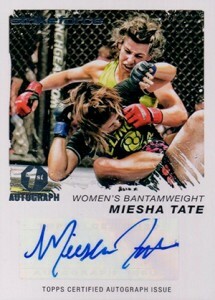 Miesha Tate's first officially licensed autograph trading card, uses the same image as her base card. However, a smaller version is used. The card's vertical orientation leaves room for the sticker autograph. Parallels include Red (#/8) and Red Ink (#/15). 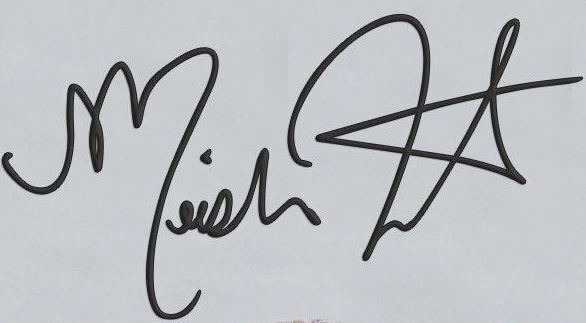 Below you will find examples of what an authentic Miesha Tate signature autograph looks like. This can be used as a first point of reference for determining the legitimacy of autograph memorabilia, but is not a substitute for having your items authenticated by a well-respected professional autograph authentication company. Some of the trusted sources within the sports memorabilia market include the following companies: PSA, JSA, and UFC. Click on any of the images below to view full size photos. Defined by a legible first name and flamboyant, individualized last, her signature is crisp and bold. The letter "M" contains a starting loop that looks like a wide shallow "U", the pen then begins a down and up stroke that often leaves a narrow loop resembling an upside down cursive lower-case "l", the humps are rounded with the second much larger than the first and tilted at about a 50-60 degree angle, a line coming off this hump drops well below the whole signature and includes a curl back up and to the right. The remaining letters of here first name are legible except for the end letter "a" which is not present and implied. The "i" is dotted and the "s" is open. Her last name is a unique combination of characters - you can see the shape of an unclosed "9" and from the bottom of this is a star shape that includes a small open loop on the top point of the "star."